As we comb the world for great snowshoeing destinations, we found two of the best here in our own backyard. Devil’s Thumb Ranch and C Lazy U Ranch – located in Grand County, Colorado – provide guests with the ultimate in winter fun and sport. I had the unique opportunity to visit both locations as a guest and snowshoer. Although I’m easily impressed, I was placed in the comforts of good living and I was immediately put at ease by my surroundings. I was allowed to partake of the Ranches’ facilities and services, including some of the best food and some of the most beautiful land designated for snowshoeing. Would I suggest visiting? Of course, but for now…I’m only providing a sample of my final write-ups. When we debut our print publication next season, Devil’s Thumb and C Lazy U Ranches will ultimately become feature articles. Complete with more photography and the details everybody will want to know, the finer points will be discussed at a later time. For now, read and make your plans to visit…and snowshoe. Mellowed posh surroundings, the “good life” placed within reach, and the tranquility of snowshoeing endless acres of Colorado land are some of the elements that compose the splendor of Devil’s Thumb Ranch (DTR). The Ranch is unavoidably charming and irrepressibly enchanting. Its flawless attempts of providing the amenities to passers-by and nightly guests are the brilliant groundwork of stress-relief and rest. Perfected comfort is what DTR is known for and a dreamscaped backdrop sets-apart DTR from other snowshoeing destinations. I visited DTR in the fresh of winter. I consider my experience an once-in-a-lifetime encounter that is available to anybody and everybody. Mountain-life luxuries are placed at the foot every bed waiting to embrace each guest. From the warm solitude of the guest cabins to the elegant tastes of The Ranch House Restaurant and Saloon, DTR is more than just a nordic center, it’s the light at the end of a dark country road…inviting snowshoers to its hallowed grounds. My wife and I found the Ranch to be enjoyably romantic. It was a snow-covered oasis left untouched by worldly exploits and masterfully preserved for many to appreciate. 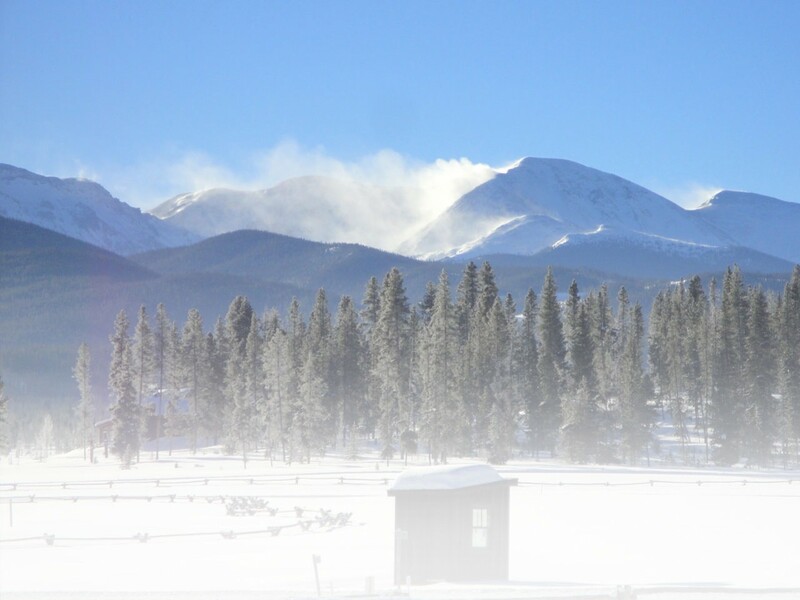 Refined and delicately cared-for, DTR is located 67 miles from Denver and 10 minutes from Winter Park Ski Resort. The Ranch is 4,000 acres of open and well-preserved terrain in the Ranch Creek Valley, close to the Continental Divide. Not only is snowshoeing a welcome activity at DTR, so are cross-country skiing, ice-skating, ski joring, horseback riding, sleigh rides, fly-fishing and much more. Watch for our feature story on DTR in the upcoming print issue of Snowshoe Magazine. I will discuss the true essence and highlights of DTR: The intricate details that went into the construction of the facilities (including the impressive wine cellar), a full review of The Ranch House Restaurant, and an overall evaluation of DTR’s complete amenities. And, Snowshoemag might plan an event at DTR next season, but that’s to be determined. Wait and read. For more information Devil’s Thumb Ranch, visit http://www.devilsthumbranch.com. Or, for current room rates and daily snowshoeing passes, call (970) 726-5632. It was as though I stepped back in time…as a timid kid growing up in Castle Rock, Colo. I could smell the pine logs as they were placed at the edge of the fireplace by my father, who had just returned home from work. Somewhere in the distance, I could hear the wind flow through the trees, and I could smell dinner cooking. I was home…somewhat. Instant comfort, instant warmth and instant family: The necessary ingredients served to guests at the C Lazy U Ranch near Granby, Colo. – about a 20-minute drive from DTR. Dating back to 1919, C Lazy U absorbs its guests and treats them to an environment that will ultimately leave a lasting impression. The history of the Ranch is its most attractive characteristic, and its 8,000 acres invite snowshoers to revel and bask in its natural playground. The Ranch has personality, and its employees highlight its character. From sledding down the C Lazy U driveway in the afternoon to enjoying a glass of wine before an enticing full-course meal, the world’s everyday irritants will be forgotten. It’s wonderfully calm. And, C Lazy U will leave every guest with a sense of adventure and a healthy dose of well-needed reality. Snowshoeing is a welcome activity at C Lazy U as well. And, watch for my article in our print issue of Snowshoe Magazine next season: There will be more details, and I hope to return to the Ranch to finish what I’ve started. For more information on C Lazy U Ranch, visit http://www.clazyu.com. This entry was posted in Destinations, Features by Ryan Alford. Bookmark the permalink.